This week has seen the release of both Malfeasance and Wish-Ender, two highly anticipated Exotics that weren’t in Destiny 2 Forsaken until now. The question is, how do you get these weapons? 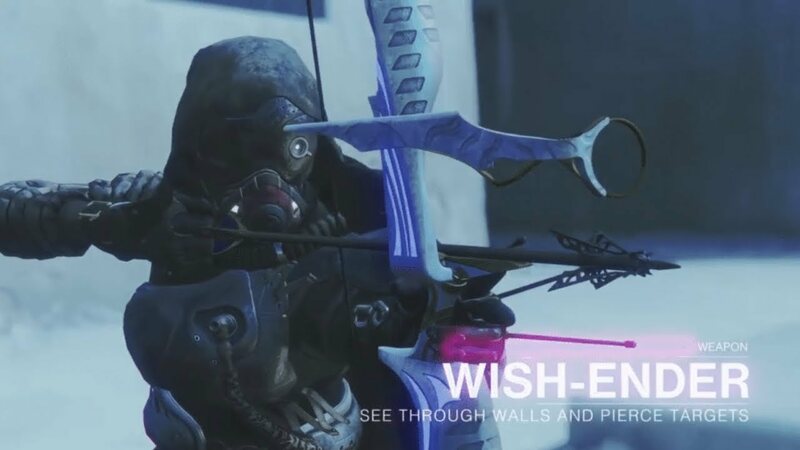 Well we’re here with a quick little guide to help you on your way to grabbing one of those, Wish-Ender which is an Exotic Bow. The first thing you’ll need to do in order to grab yourself Wish-Ender is hit the new Dungeon in The Dreaming City, Shattered Throne. In order to access this you’ll need to go through Taken portals which are scattered around the location. You can find one of these portals in the Spine of Keres. Once through you need to take on the Dungeon itself, which is populated with enemies up to 590 Power Level. If that’s not enough to scare you off, then just be prepared because these guys aren’t messing around. This whole area is what equates to a three person Raid, and is not for those hoping to cheese sections of Destiny 2 Forsaken. After that you need to find the mission ‘Prove Your Worth’ in Four-Horn Gulch. The mission is represented by one of the specks of Light associated with Toland the Shattered. By completing the mission you’ll earn three tokens that let you summon hidden bosses in the Shattered Throne Dungeon that you’ve just completed. This mission is a 580 Power Level and again, not for those who aren’t up for the challenge. Now you need to head back to the Shattered Throne Dungeon and find statues with no balls in their hands, and the charges that go with them. Every token summons a boss, and by killing the bosses you charge the tokens. Check out the video below for a guide to the locations of the statues. Once you’ve summoned all the bosses you’ll need to kill the final boss. After that’s done, providing you’re good enough to do it, then a statue will offer you Wish-Ender as a reward and you can go around shooting Taken eggs with it all you want. The bow overpenetrates through targets and allows you to see through walls when aiming down sights. Overall it looks like a pretty great Bow, if not the best Bow in the game so far. Let us know how you get on with grabbing Wish-Ender in the comments. Previous articleHave Guardians Found The Malfeasance Quest Line?